Do you ever reach for something SO far away from your normal personal style that you almost have to give yourself a shake...? "Erm, what ARE you doing Sam!?" Well, for me, today was one of those days. This outfit is a perfect example of a romantic, floaty and feminine look... not my usual vibe at all. I'm even wearing a string of pearls. Feeling like a lady and (surprisingly) loving it. Sometimes it's great fun to play around with your personal style. Fashion is supposed to be FUN after all! This is a great wedding guest outfit. Dressed up enough to make the effort but not too OTT to be disrespectful. 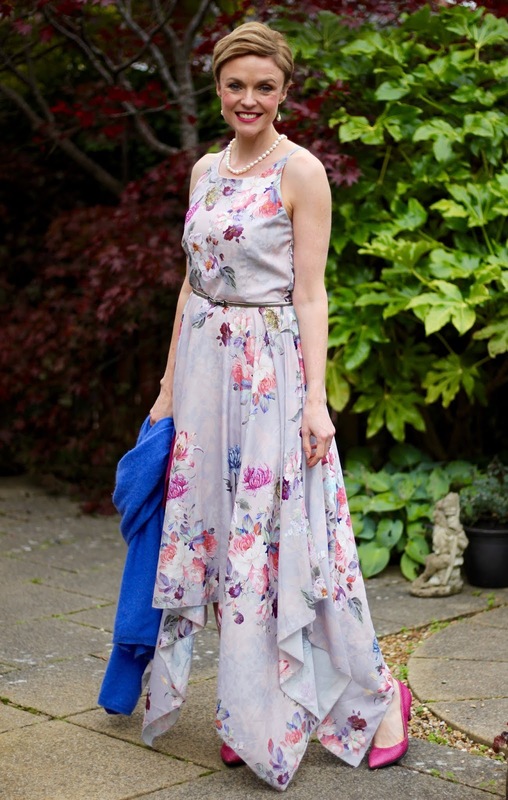 A floaty hanky-hemmed dress in soft colours is easily accessorised with a metal bow belt and a string of pearls. I could have added something geometric or bold but sometimes it's good to wear a different piece. 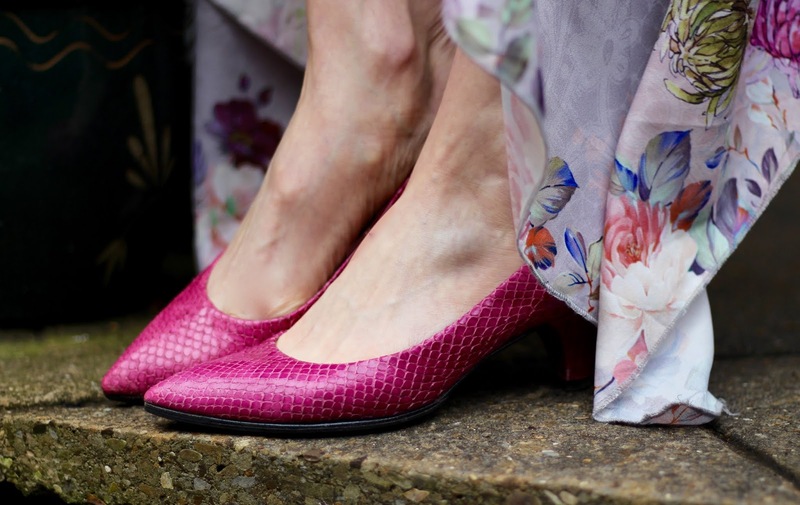 I've added my favourite wrap (which I wear everywhere from sofa surfing to yoga) and these pink shoes. These shoes are THE comfiest heels I own. They're old Marc Jacobs and I've never found a pair as comfortable. The heel is not high at all and I can easily walk around all day. Maybe not the sexiest of heels but perfect for an all-day event. Where did you get your perfect all-day heel? Or, are you still on the hunt? I'd love to hear about your favourites and have some new brands and styles to search for! SHOES: Marc Jacobs (old) ... these are CUTE and on sale. Love the hanky hem dress. Lovely print and looks fab with the pink shoes. Oh Sam!!! I love you in this romantic look!! The print of that dress is SO pretty and your wrap and bright pink shoes finish everything off beautifully. You may not think that you have romantic style leanings but I see it in your outfits/personna quite often,especially during the warmer months. I'll bet you were the prettiest guest at the event! You are very kind Judy. You should treat yourself or ask Santa to sort you out?! I use mine almost every day. It's good to step out of our comfort zone from time to time and Sam you're doing that with such panache. I love this hanky hem dress and that cosy cashmere wrap must be an absolute asset to your wardrobe. You're positively glowing here! I felt comfortable and confident. I wear this wrap just about every day... I may treat myself to another colour! You look adorable in this 'romantic' look too, gorgeous!. I like particularly that you added a cozy wrap and sensible heels to keep it comfortable for an all-day event! and still looking elegant! I wear flats all the time and have had to build my 'wedding appropriate' outfits around my shoes. So this means lots of dressy pants! I'm the same Monica... shoes first and for an all day event COMFORT first too!! 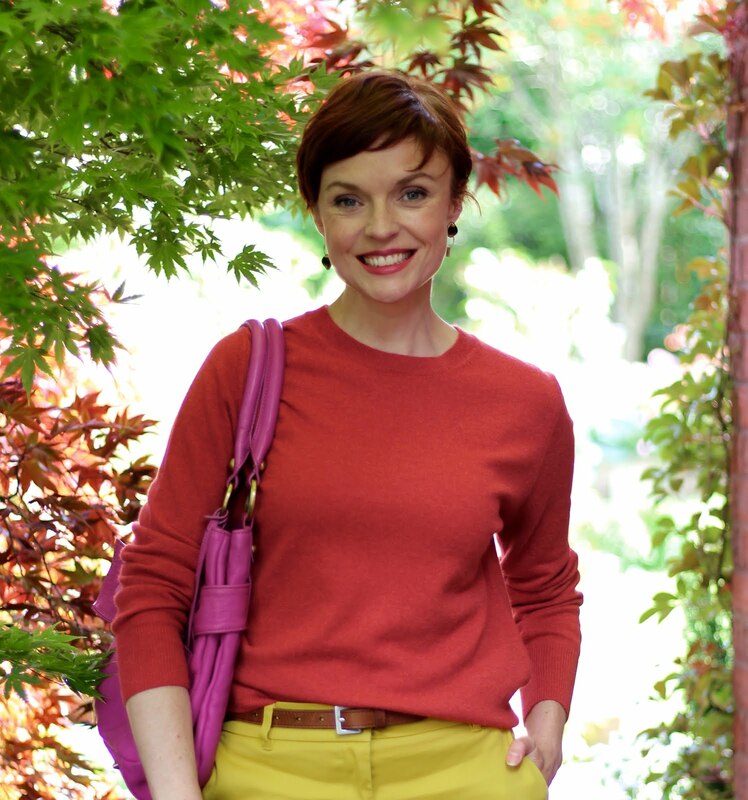 I do hope you'll join me on the #chicandstylish #linkup on Thursday. You look just lovely in this outfit, Samantha! 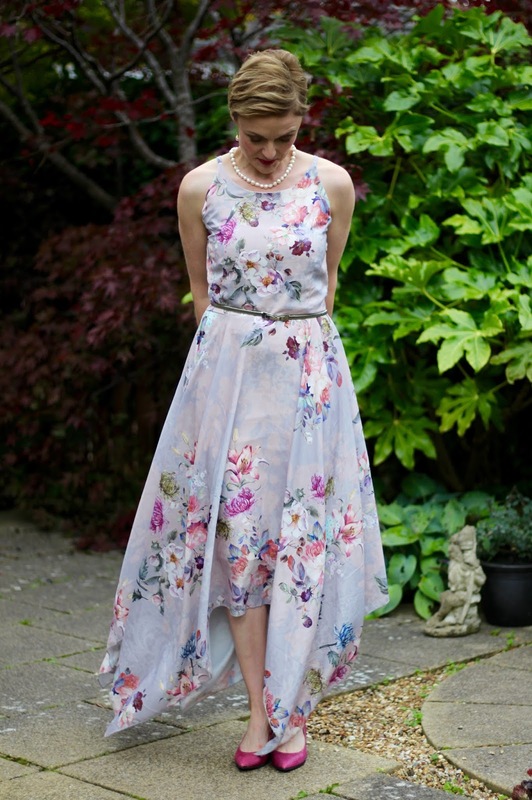 I love the handkerchief hemline and the soft floral mix, and especially the pops of bolder colour in the wrap and shoes. I've just been to a wedding myself, and my shoes did NOT hold up. Yowch! Oh no Sheila!!! there is nothing worse! Did you bring spares or did they get kicked off?! That wrap. I love it! It looks wonderful with your dress. I just love larger florals and this print is so pretty, the soft color looks great on you. The hem is so cool and different. The heels are a great color and just perfect for standing at an event such as this. What are the Fashion Bloggers REALLY wearing?